I'm using LEGO Digital Designer (Enhanced) to aid in the design and construction of a sailboat. 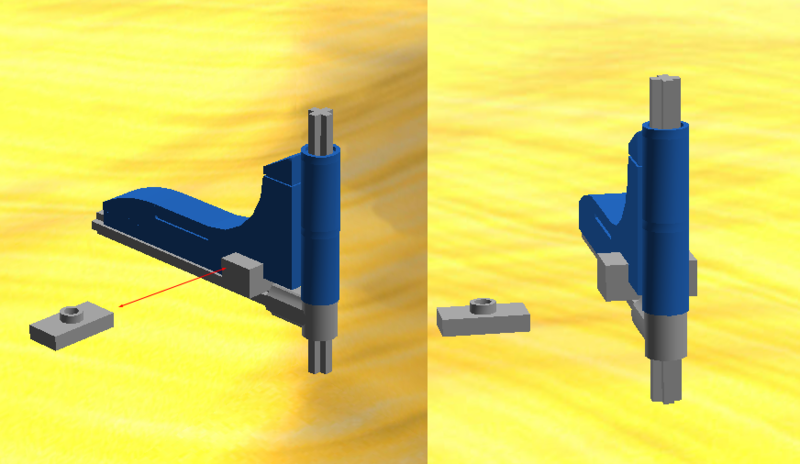 Mast (vertical), boom (horizontal) and sail cover (blue) (see diagram) are currently all built of standard bricks, but I want to try to make mast and boom out of axles (the + things) instead. I cannot seem to find any parts that will allow me to attach the brick sail cover to the boom axle or to the mast axle (either one will do). 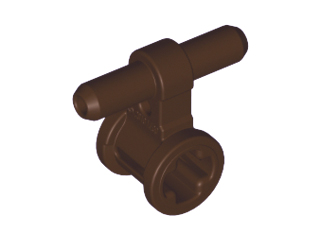 BTW, it is not critical that it be a part supported by LDD; if there's a part out there that works, I will buy it, even if I can't use it in LDD. See my diagram. 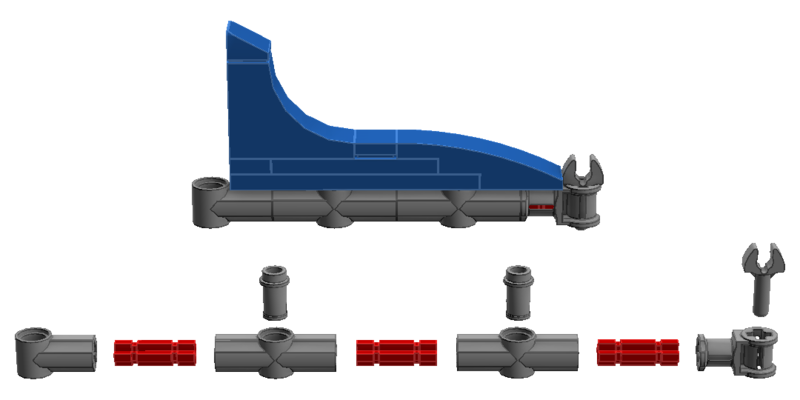 The red X is what I currently have built, and the sail cover (blue) attaches to the brick boom fine (see 1 in diagram). I want to see if I can use axles instead (the green checkmark), but I can't find any pieces that cross over from axle to brick. 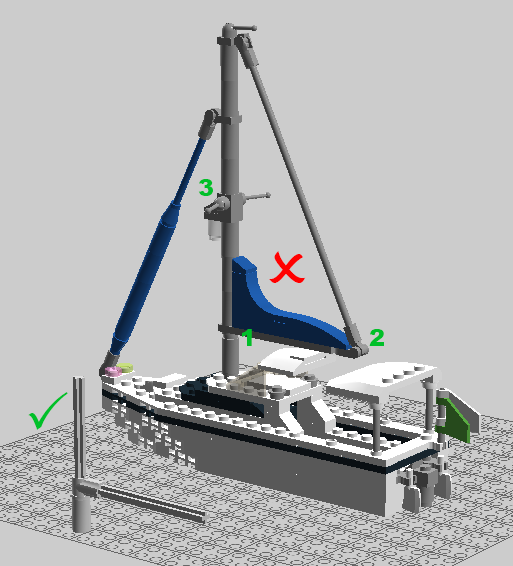 2 and 3 in diagram are also places where I'll want to attach bricks to the axle (as well as cables), but that won;t matter if I can't secure the sail cover to the boom. I'm afraid I can't think of a way to do it that isn't extremely bulky, but I think what you've done looks great as it is! I think the last one is probably the best chance. I would probably also try something using one of those pieces to attach the sail cover to the vertical mast as well, to keep it from rotating around the axle. Thanks. Those are definitely the right family, but they're oriented wrong. The 2x2 is oriented right, but of course, it's too (two) wide. However, I'll go searching for parts with "pin hole" and see what turns up. b] rotate the brick interface to the correct orientation. I'll have to decide if that is an overall aesthetic improvement over what I have. Perhaps part #6541 attached to the bottom of the sail, and run the axle through the hole? Well now that is a very interesting solution! That opens up a whole bunch of possibilities.